Front and back cover showing BASH, 1971, Screen print, 85 x 70 cm. The Artist Eduardo Paolozzi (1924–2005) was a unique cultural figure. His varied yet instantly recognisable work chronicles the significant changes in British art from the austere 1950s to the post-post-modern late 1990s. This highly illustrated and visually exciting book provides the first comprehensive overview of the career of a major, prolific and complex artist, exploring Paolozzi’s work from all periods and across all media: collage, sculpture, printmaking, ceramics, tapestry and film. An Italian Scot, Paolozzi studied first at Edinburgh College of Art, before moving on to the Ruskin Drawing School and the Slade. He was a founding member of the Independent Group in the early 1950s but steadfastly resisted the ‘Pop’ label, preferring instead to see his pioneering interdisciplinarity as an extension and an expansion of radical Surrealism. 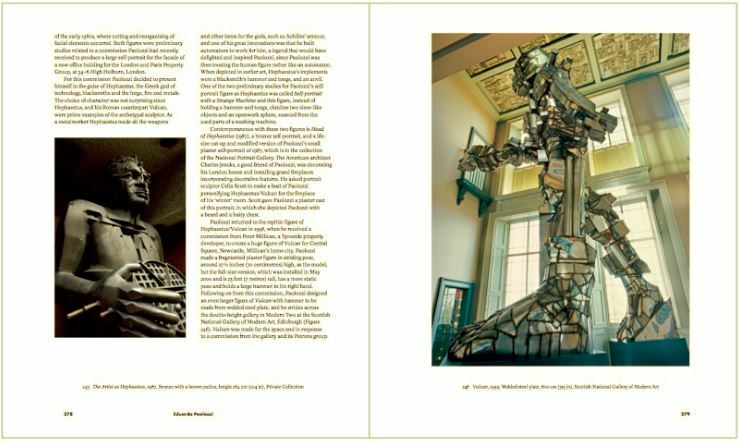 Dedicating a chapter to each facet of Paolozzi’s wide-ranging practice – including, in turn, his bronze, aluminium and public sculptures, as well as his early collages and his innovative screenprints – this book offers the definitive, illustrated, art-historical appraisal of an artist whose work continues to fascinate and inspire. An imaginary subtitle that I repeatedly referred back to when reviewing this book was Eduardo Paolozzi – his work. His work. The moment I started to deplore the lack of some personal element that I felt was essential – a story, an insight that wasn’t elaborated on – I held myself in check, telling myself to review the book as it was intended and not as I wished it to be. Striking a balance between the claims of an artist’s biography and those of his work is tricky to say the least. This book, however, is far from a glorified catalogue and does feed us some tasty snippets. Collins tells us briefly that Paolozzi did not care for the Slade School staff; that he mistrusted dealers and behaved unprofessionally by selling works at lower prices and probably making casts of editions. He would go to the cinema in Berlin and sit behind the screen as it was much cheaper, but would, of course, see everything in reverse. These are tantalising glimpses of Paolozzi the man, but to satisfy our curiosity about him we still have to reach for Robin Spencer’s book Writings and Interviews (2000), an acknowledgement that Collins herself makes. I was fortunate to have been befriended by Eduardo Paolozzi in the mid-90s. Familiar with his extraordinarily prolific working life and appreciating the imposing yet generous minotaur that he was, my sense of anticipation when this book came out was greatly fuelled. I braced myself for a huge tome that would require a mechanical/human neck-brace of Paolozzi design to allow me to lift it. My first reaction was surprise at its relatively manageable size, though it is large format and weighs a hefty 2kg. Thoughts of exaggerated physical enormity were all of my own making, but I am afraid that having read the book from cover to cover I am still of the same opinion: despite its size the book is simply not big enough. As a designer who has produced and picture-edited many illustrated books, I should say that I do not underestimate the enormous task of compiling this volume – not only what to include and what to leave out but also what to give precedence to, as well as, no doubt, having to meet the inevitable constraints imposed by the publisher. Such is the colossal outpouring from the mind and hand of Paolozzi that to include everything would be impossible. Nevertheless, there are some areas within this book that I found lacking and significantly so. The design of the book itself, however, is excellent. Bright green, red and pink prelim pages call to mind Paolozzi’s 1971 work Who’s Afraid of Sugar Pink and Lime Green? Not John Morgan Studio, that is for sure. The designer uses colour to great effect and it is not lost on me that the green endpapers and red first page are a nod to the Italian flag. I note also that the typefaces used throughout are Concorde and Futura – names Eduardo would have appreciatively smiled at. Of the two, Concorde has been chosen with its small non-aligning numerals, meaning their height is less than that of the upper-case letters, a detail that is of utmost importance when typesetting a book with many dates – one of the signs of a good book designer. Double page spread showing detail of Paolozzi’s neo-Byzantine fantasy. ‘The first comprehensive overview’ and ‘the definitive, illustrated, art-historical appraisal’. Can a book be both an overview and definitive? Indeed, can a historic account be definitive at all when new discoveries and revelations are inevitably yet to be made? This claim is not the author’s doing. It is a marketing puff for the jacket, written to sell books. Unfortunately it also sets the book up for a fall when in the hands of a demanding reader. That said, to give Collins her due, there are moments of extraordinary detail within this publication: the individual strips that Paolozzi cut from Time magazine to create his collages are all referenced to their respective issues. 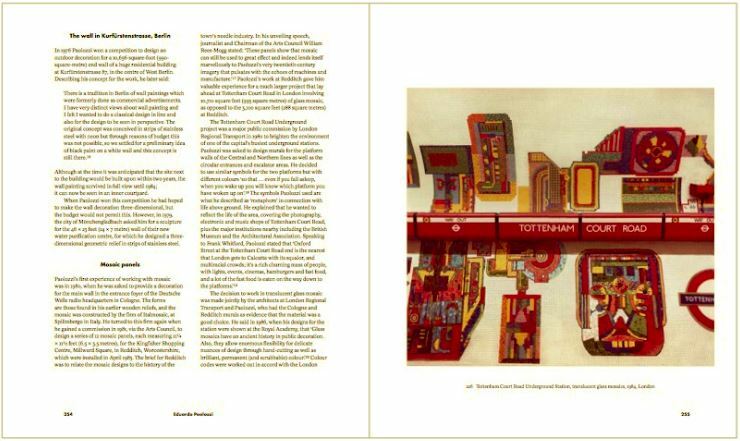 There are revealing insights, including extracts from reviews of Paolozzi’s exhibitions throughout the decades that offer a historical, contextual account of the artistic mood of the day. Such attention to detail and ferreting out of information might persuade the reader that this book is indeed inexhaustibly thorough. That is not so. Most notably, Collins fails to address the role Scotland played in Paolozzi’s revival after the critical failure of his Tate show in 1971, which met with several hostile reviews. It was Paolozzi’s 60th birthday exhibition at the Royal Scottish Academy in 1984, conceived by Barbara Grigor and Robin Spencer of the Scottish Sculpture Trust, that consolidated Paolozzi’s reputation both at home and abroad, especially since this was the first Edinburgh Festival show to transfer to five continental art centres, since the one devoted to Charles Rennie Mackintosh in 1968. The Paolozzi exhibition went hand in hand with Grigor’s Channel Four film EP Sculptor which won the Rodin Prize at the Paris Biennale. None of this is recorded. There are a number of other holes, mostly missing pictures. The Laocoön which is referenced several times as ‘one of a select group of many motifs that permeate Paolozzi’s artistic creations’ is never shown. Nor do we see enough of the work of other artists who influenced Paolozzi. Electric Bishop is one of the most colourful plaster heads, yet it is not shown; instead we see four typically white examples. Collins remarks in a one-liner that ‘the oddest fragmented head is Head of a Blind Poet’; it is illustrated and we can see that it is indeed odd, but why is there no explanation of its peculiarity? Likewise, Paolozzi’s reluctance to accept the Labour leader John Smith’s commission is mentioned but there is no visual and no reason is given for the artist’s unwillingness. We read about the rarity of sculptural female figures in Paolozzi’s work, with Collins several times referencing Selfridges’ Josephine Baker, and it would surely be desirable to see them. Sadly, they are not illustrated. Without knowing the availability of these images (not least financially), it is impossible to say whether their omission was an oversight or cruel necessity. Of course it would be tedious repeatedly to read ‘image not available’, and with Google at our fingertips does it really matter? In an illustrated book I believe it does. It is interesting that in her introduction Collins tells us: ‘In the current climate of inter-/trans-disciplinary work and the dissolution of boundaries, Paolozzi’s ideas and ways of working seem very contemporary.’ This modernity extends to me, as I read with the book in one hand and iPad in the other, searching for the many images that have not been shown. Cross-platform indeed. Double page spread with detail of The Artist as Hephaestus, 1987 and a summary account of the work. Most troubling, however, is the absence of Paolozzi’s 1987 sculpted selfportrait,The Artist as Hephaestus. Yes, it is there, as a closely cropped photograph(rendering its siting non-specific), along with a summary accountof the work, but a vital piece of information is absent. Back to that man on the street whom we have now hopefully enthused and inspired; he is left scratching his head and wondering if he has taken a wrong turn because the sculpture is no longer in its original location at 34–36 High Holborn, London, having been controversially – and allegedly illegally – removed and sold in November 2012. Why is there no mention of that fact in this ‘definitive’ book? It is certainly not an oversight. Dr Judith Collins is credited on Bonhams website as having compiled the catalogue entry for its sale. Urged on by the Twentieth Century Society, Camden Council continues to fight for the return of the sculpture, maintaining that ‘it is an integral part of the streetscape’ that has been ‘whisked away without any discussion. It may be private property but it is public art in a public area’. Sadly that is not the only Paolozzi public work under threat. In 1979 the artist was made a Royal Academician and the following year received the commission for Tottenham Court Road underground station, unveiled in 1986: a 995m2 neo-Byzantine fantasy now partly destroyed by Crossrail. More than 7,500 people signed an online petition protesting against the demolition of the mosaics as part of the Crossrail redevelopment scheme. Following a meeting with developers, the Twentieth Century Society has now established that three of the four arches above the escalators have already been lost. Collins shows great self-restraint (more than I am about to demonstrate here) in holding back personal stories of her friendship with Paolozzi. From the two anecdotes that she briefly shares with us we get a glimpse into the enormous generosity of the artist. 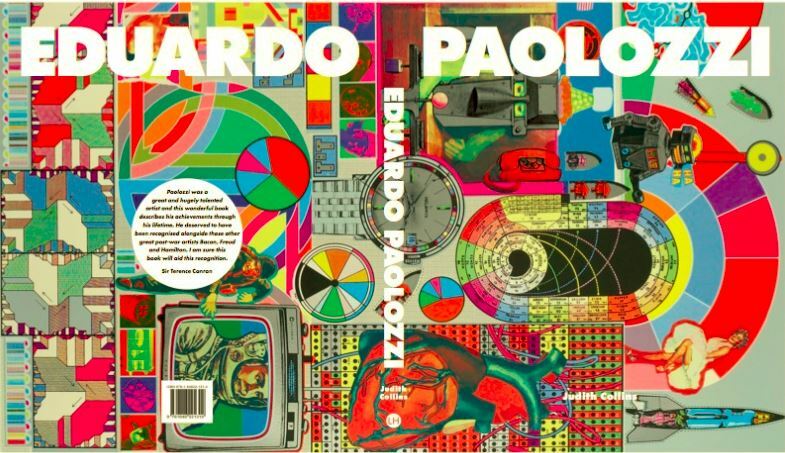 ‘To those who were particularly close to him, Paolozzi gave presents.’ As one of those lucky enough to have counted Eduardo as a close friend, I have to say I always felt rather uneasy about accepting his presents. It is a difficult thing to quantify, but such was his generosity that I felt I could not possibly accept many of the pieces he wanted to give me. To my mind, they belonged in museums for all to see. He resorted to mailing me all manner of things in the post. Not wishing to offend (and delighted by his tenacity) I reciprocated. And so, for many years, in a corner of my studio there was a box labelled ‘EP’: whenever I found anything that I thought would be of interest to EP it went into the box and I mailed him back parcels of goodies. This postal exchange went on for a number of years. I understand from Robin Spencer that a polka dot stiletto shoe that I simply popped into the post, with Eduardo’s address written on the sole, is now in the Tate stores. 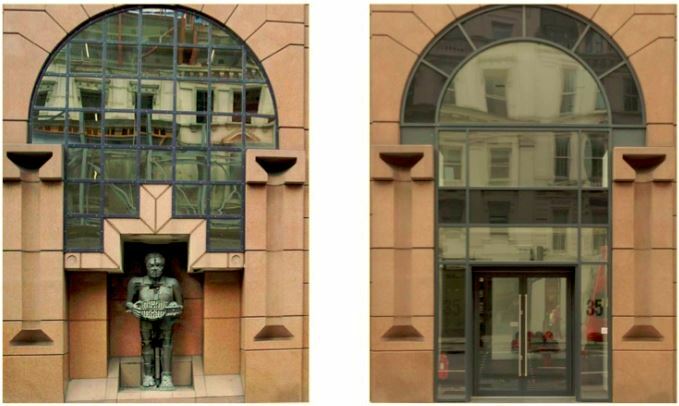 Before and after: The Artist as Hephaestus shown in situ 1987 -2012 and how the building looks, remodelled, today. Speaking of stores, an item that Eduardo insisted I accept was a tin head that sat on the window ledge inside his studio door on the right – not a ‘proper’ sculpture but a three-dimensional model. On entering his Dovehouse Street studio in Chelsea (purpose-built for the artist in 1959), I would always greet it. Eduardo once remarked ‘Why do you always insist on greeting that tin head before you greet me?’ to which I replied ‘It makes it to the door quicker than you do!’ He gifted me the head and I accepted on the condition that it stayed exactly where it was. Opening The Guardian Arts section back in 2008, I was saddened to see the serene tin head peeping out of a box, buried in the Granton Art Store in Edinburgh – the depository for works belonging to the National Galleries of Scotland. If the curator of the Paolozzi Collection is reading this, please replace the tin head back on the window ledge. For those readers who are unaware, Paolozzi’s Studio has long since been transported to the Dean Gallery, Edinburgh, joining the studios of two other sculptors already preserved for all to see – Henry Moore’s (Perry Green, Much Hadham, Hertfordshire) and Barbara Hepworth’s (St Ives). And quite right too.